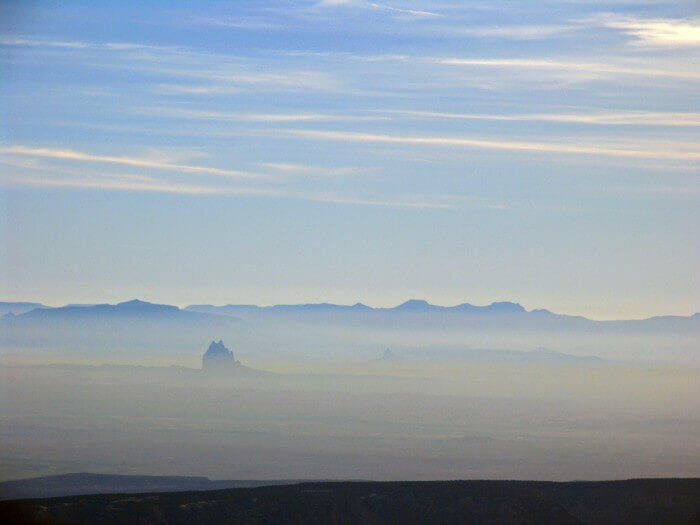 Smog in the Four Corners is an air pollutant formed from oil, gas, and coal emissions that threatens local public health. In 2018, the American Lung Association gave La Plata County, CO an “F” for ozone pollution. Ozone is formed through interactions between volatile organic compounds (primarily from oil and gas), nitrogen oxides (primarily from coal), and sunlight. Ozone is particularly prevalent above the San Juan Basin, as two massive coal-fired power plants release copious amounts of nitrogen oxides alongside the thousands of oil and gas wells spewing VOCs. Exposure to ozone can cause or exacerbate respiratory health problems, including shortness of breath, asthma, chest pain and coughing, decreased lung function, long-term lung damage, and premature death. There is no room for growth of the industries that contribute nitrogen oxides and VOCs to the San Juan Basin’s ozone problem. Regional haze is the reflection of light off pollution particles in the air. Haze limits visibility from national parks and threatens public health.